The Russian Federation intends to restore prestige and territory lost with the fall of Soviet Union. The key military objectives associated with this geopolitical thrust are confronting the eastward expansion of the North Atlantic Treaty Organization (NATO) over the European continent and denying the United States free access and power projection in the global commons, specifically in the maritime domain. 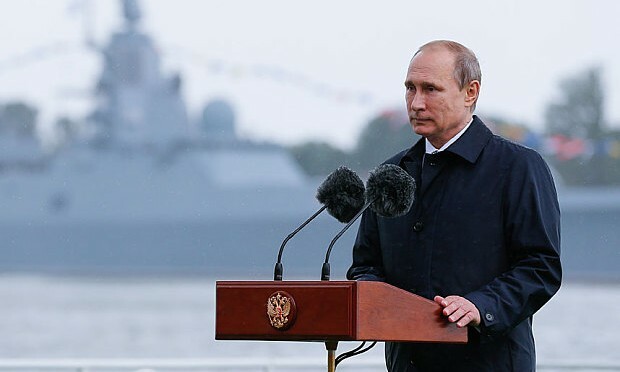 Vladimir Putin personally announced a new Russian maritime doctrine reflecting these objectives. In this process, the Russian Navy is showcasing characteristics reminiscent of Sun Tzu’s Art of War. Referring to Sun Tzu is not a new phenomenon for traditionally Western navies. Germany’s emperor Wilhelm II wished he could have read Sun Tzu before World War I and General Douglas MacArthur was known to have referred to his teachings. An analysis of Russia’s way of warfighting in Ukraine, especially across Crimea, revealed the application of Gerasimov Doctrine that advocated targeting an adversary’s weaknesses while avoiding direct confrontations. This is one of the significant principles of asymmetric warfare preached by Sun Tzu. Sun Tzu’s famous dictum is that all warfare is based on deception. He counselled that one should appear weak when strong and strong when weak. He advised showing presence at places where not expected by the adversary and striking at weak points. Denial and deception were the key tactics employed by Russia when annexing Crimea and gaining the warm water port of Sevastopol permanently. The Russian Navy played phantom games within the territorial waters of Baltic countries and buzzed US warships in the Black Sea and the Pacific Ocean. By showcasing presence and performing unsafe activities in the maritime zones flanking its territory and other areas of interest, the Russian Navy intends to deter its adversaries from concentrating their resources on its current maritime zones of interest – Europe and the Middle East. For Putin, Ukraine and Syria are the proving grounds for Russia’s re-emergence in the international order. It is imperative to deny other navies from gaining an upper hand in these zones either for military strikes or for reinforcing diplomatic manoeuvring. However, the negligence on the part of Russian administration towards the navy weakened its strength and technological sophistication to directly confront the navies of the US and NATO. This makes it imperative for the Russian Navy to adopt the asymmetric means of warfighting. Therefore, the Russian Navy is enumerating the art of sea denial by constructing an ‘arc of steel’ between the Arctic and the Mediterranean via the Baltic and Black Seas. This resembles, at least in conceptual terms, China’s Anti-Access/Area Denial (A2AD) strategy in the Western Pacific, which is itself influenced by Sun Tzu’s teachings. The students of Mahan know that the raison d’être of a navy is to keep open the sea lines of communication and protect the trade passing through them. A strong navy is especially critical for the US, concerned as it is with its relative decline in the global order after the wars in Iraq and Afghanistan and concentrating on economic rebuilding. By operationalizing a local but strong sea denial construct, the Russian Navy is setting a limit on its competitors’ power projection capabilities. Lacking unimpeded access to the maritime domain also curtails free movement of trade and affects the economy of the US as well as of its allies and partners in Europe. This is what primarily concerned the US Chief of Naval Operations, Admiral John Richardson, as he spoke about the adverse impact of Russian maritime activity on the trade transiting the Mediterranean. In essence, the Russian Navy is practicing a prominent dictum of Sun Tzu – winning without fighting. Apart from securing trade, the US Navy also performs global power projection for deterring and defeating aggression against American interests. Such a task involves providing sufficient numbers of warships fitted with advanced sensors and weapons. The political administration directs these assets to be deployed in certain areas of responsibility, protecting interests and responding to threats. The Obama administration ordered deployment of sixty percent of US naval assets to the Asia-Pacific for maintaining peace and stability in this region, upon which the US economic build-up is dependent. A significant portion of these assets are appropriated as a response to China’s naval build-up and its assertive maritime activities. The US Navy is expected to handle any military aggression in this region without serious operational concerns arising in other areas of responsibility. However, it would be hard-pressed to contain the rise of a serious threat in another region with the backdrop of the US’ declining capability to fight and win two major regional contingencies simultaneously. To relieve this situation, the US Navy and its patrons in the US Congress have vehemently opposed imposition of “sequestration” on the force’s budget, but constraints remain. A fierce battle erupted in Congress regarding funds for new ballistic-missile submarines (the Ohio Replacement Program). The construction of Ford-class carriers and Littoral Combat Ships is advancing but with criticism and budget shortfalls. On the operational front, the US Marines are contemplating plans to hitchhike on private vessels to reach forward positions. And the US Navy is now operating in the Middle East without a carrier for the first time in recent years while the region is experiencing renewed conflicts. These issues point to the fact that the US Navy is indeed overstretched and short-funded. This is the weak point Sun Tzu would strike at. Thus the Russian Navy has opened another contested maritime zone. To confront destabilizing Russian naval activity, the chief of the US Sixth Fleet is pressing for deployment of additional warships in his area of responsibility while Admiral Richardson contemplates enhanced presence in Europe. If carried out, it might require transferring a few platforms intended for the Asia-Pacific before the US shipbuilding activity reaches a level to satisfy the emerging requirements. Attempting to convince the present White House administration of such a transfer would be in vain. Therefore the dilemma persists within the US Navy and the White House which maritime zone should be accorded primary focus. By aggressively parading the navy and establishing its sea denial construct, Russia is aiming to incapacitate the navies of the US and NATO from performing their fundamental roles of protecting trade, safeguarding global commons and power projection. The Russian naval threat has driven the logic of numbers and maritime strategy of the US Navy to ground, forcing an overhaul. Without the American naval support, the NATO forces would also experience serious constraints. Thus the navy is emerging the spearhead of Russia’s re-emergence and offence against its adversaries by simply referring to Sun Tzu. Vidya Sagar Reddy is a Research Assistant at the Observer Research Foundation, New Delhi. Reading Admiral Gorschkovs Seapower I doubt that the Russian Navy follows Sun Zu. But they have understood some principles of sea power written by Julian Corbett. By the way: the PLAN too.